Even though ear tubes reduce the risk of ear infection under general circumstances, a child with ear tubes in place faces a greater risk of infection if she goes swimming. Ear tubes allow water to enter the middle ear more easily, which could cause your child severe discomfort and pain, especially if an infection starts. Ear tubes are surgically implanted tubes placed through the eardrum that allow proper air circulation. Doctors typically recommend ear tubes for children who have frequent ear infections or fluid behind the eardrum, resulting in hearing loss. According to Virginia Commonwealth University Medical Center, the tubes typically remain in the ear for 12 to 18 months. If the ear tubes do not naturally migrate out of the ear after this point, a doctor may opt to remove them surgically. If your child has ear tubes in place, talk with your doctor before allowing her to swim. If your doctor allows your child to swim, you should still restrict her from diving or dunking her head under water as much as possible. Water can dislodge the ear tubes, especially if your child dives deep, where the water pressure becomes greater. The College of Medicine at the University of Florida warns that you should only allow your child to swim in clear, chlorinated water found in pools -- and avoid the un-chlorinated water found in springs, lakes and oceans. The bacteria found in un-chlorinated water puts your child at a higher risk of developing an infection. Earplugs or swimming caps may help reduce the risk of water and bacteria entering the ear during swimming. Most drugstore ear plugs work effectively, but many audiologists also offer custom fitted earplugs for children with ear tubes. If your child gets water trapped in an ear after swimming, drain it. Have her lay on her side with the water-logged ear facing down for 10 to 15 minutes. The Nemour Foundation also recommends drying your child's ears with a hair dryer on a low setting after she gets out of the pool. Swimmer's ear occurs when bacteria enters the ear canal via moisture. Water that contains bacteria prior to entering the ear can cause an infection, as can water that gathers and breeds bacteria as it sits in the ear undrained. Children with ear tubes in place cannot use over-the-counter alcohol ear-drops to help dry out the ear, putting them at greater risk of infection if water does get lodged. If your child has ear tubes and gets an infection after swimming, immediately contact your doctor. The doctor will likely prescribe an oral antibiotic or antibiotic ear-drops. 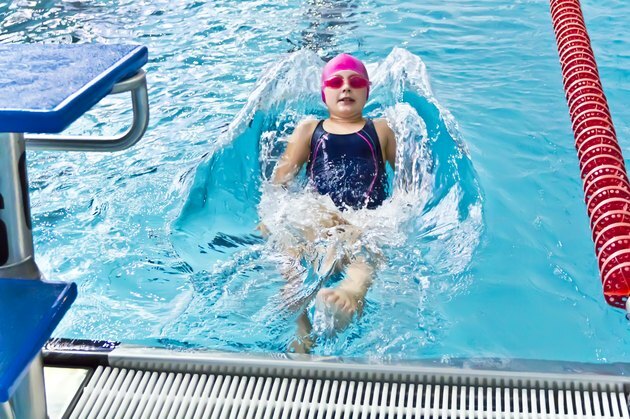 The Nemours Foundation, KidsHealth: Can I Prevent Ear Infections When My Child Swims?